I know all too well that the vast majority of things I keep in the attic are no longer useful and I would be better off without them. Nevertheless, somehow I keep adding new stuff to the inventory and sooner or later I will have to do the right thing and start a massive cleaning process. Meanwhile, my main concern is to store these products as well as possible and every now and then I need to relocate them from one place to the other, until a more definitive solution is reached. Having said this, I don’t mind spending some time to come up with innovative storage totes and my latest idea is to create ones made of fabric. 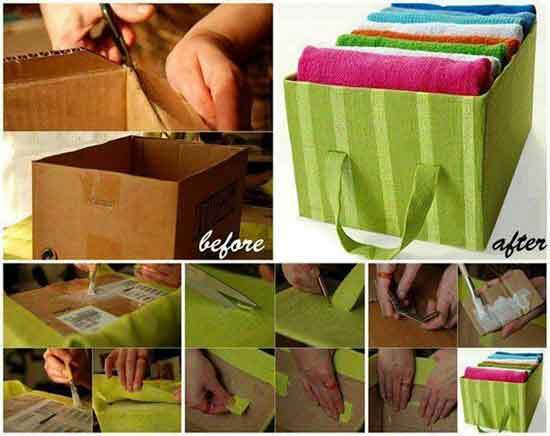 The process itself seems to be time-consuming, but only until you get the hang of it, because once you create your first fabric storage totes, you will be anxiously waiting for your next masterpiece. Depending on your expectations different materials can be used, but unless you have extraordinarily high standards, you won’t even have to buy anything. A simple box and pretty much any fabric will do, so there are no hidden costs or other sort of strings attached to fabric storage totes.